Mourinho in post-match controversy as late United comeback stuns Juventus - SABC News - Breaking news, special reports, world, business, sport coverage of all South African current events. Africa's news leader. 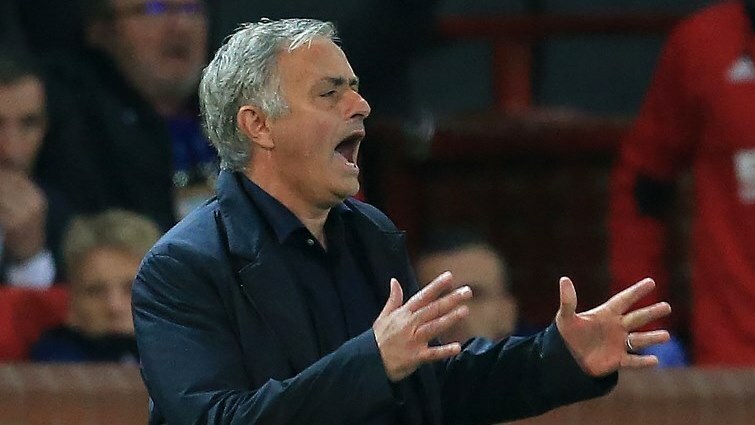 Manchester United's Portuguese manager Jose Mourinho shouts instructions to his players from the touchline. Manchester United snatched an extraordinary 2-1 win at Juventus in the Champions League on Wednesday (November 7) with a late free kick from Juan Mata and a scrappy own goal reviving their hopes of reaching the last 16. Cristiano Ronaldo looked to have haunted the club which turned him into a global superstar when he volleyed in the opening goal in Turin, Italy, in the 65th minute after Juventus had dominated proceedings and struck the woodwork twice. Jose Mourinho’s side had looked toothless in attack but after the Portuguese threw on Mata, Marouane Fellaini and Marcus Rashford late in the game they staged the most unlikely of comebacks to revive memories of their epic 3-2 win from two goals down in Turin in the 1999 semi-finals. Spaniard Mata equalised with a perfectly-executed free kick in the 86th minute and United caused bedlam in the Juve area with another set-piece, with the ball appearing to go into the net off Alex Sandro after a knockdown from Fellaini. Competition organisers UEFA later credited Juve defender Leonardo Bonucci with the goal, which meant United became the first English team to beat Juventus away from home in 15 years, when a previous United team, inspired by Ryan Giggs, won 3-0 at the old Stadio dello Alpi in 2003. The stunning finale prevented Juventus from sealing their place in the last 16. They still lead Group H with nine points but United are second on seven, two ahead of Valencia in third place, while Young Boys are bottom of the group and can no longer finish in the top two. There was more controversy surrounding Mourinho after the match as the United boss cupped his ears in a gesture aimed at Juventus supporters, and his celebrations prompted Juve players to approach him. This entry was posted on 08 Nov 2018,06:01AM at 6:01 AM and is filed under Sport, Homepage Latest Stories Slider. You can follow any responses to this entry through the RSS 2.0 feed. Both comments and pings are currently closed.